https://ncci1914.com/wp-content/uploads/2018/08/fff_gbconcerns20180829.jpg 315 560 Roger Gaikwad http://ncci1914.com/wp-content/uploads/2018/05/NCCILOGO105-300x72.png Roger Gaikwad2018-08-30 19:19:172018-08-31 06:00:40Floods! Fundamentalism! Franchise! This is an update from a Constituent member body of NCCI, Church’s Auxiliary for Social Action (CASA) on their relief work for Kerala floods. Received the following by email from Joseph P. Sahayam, Additional Emergency Officer (HQ), CASA. As you are aware the Monsoon Floods in Kerala has created havoc in 13 of the 14 districts in Kerala. CASA has been responding since the first flooding in July and continuing the intervention in the Second wave of floods with many of the Church Partners. I am herewith sharing the updates on our intervention and the same is appended below. Apart from this CASA is also directly intervening in Wayanad and Idukki providing 1200 Dry Ration Kit, Tarpaulin, Hygiene Kit and Support for 150 House Repair and 1100 Shelter and Non Food Items in Idukki. CASA staff are Stationed in the above mentioned districts. 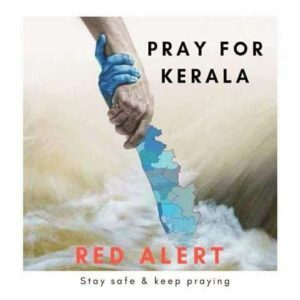 Please continue to remember in prayer the relief operations in Kerala undertaken by CASA and other constituent bodies of NCCI.